*Taco shells are available at leading supermarkets. In a 10″-hot frying pan, put margarine, siling labuyo and beef. Stir until beef changes color. Add prego and cook until boiling. 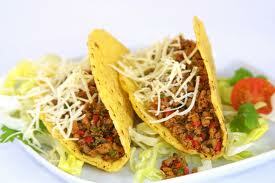 With a spoon, put beef mixture on taco shell, top with cheese then lettuce. Arrange tacos on tray.